Every day since leaving on this adventure, the thought of getting robbed has been on my mind. In fact, we left all our valuable watches and jewelry back in the states to make us less of a target. At each hotel, we are careful to lock up (or hide) our computers. When going out, we split cash and credit cards into separate pockets and don't ever try to carry too much. We also use one of the kid's backpacks for walking around. No one keeps valuables in a Team Umizoomi backpack, right? Well, it finally happened. Someone tried to pick-pocket me. 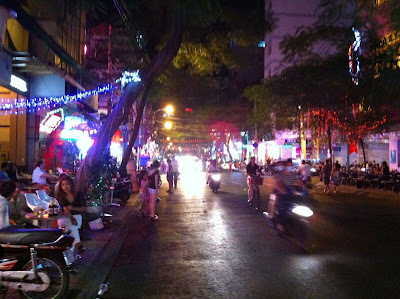 We arrived in Saigon around 8pm. The noises, motorbikes, smells and sights immediately overwhelmed us (well, certainly me). At first sight, the streets are crazy busy - like getting slapped in the face. There are so many motorbikes and everyone uses the sidewalk to park them. 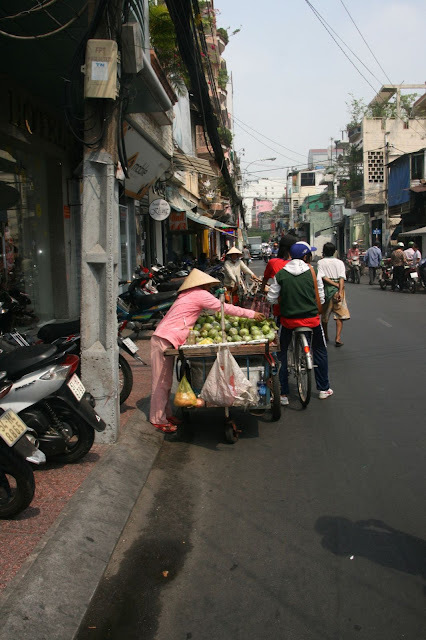 Our hotel is about two blocks away from the backpacker district in Saigon. We arrived to find out the hotel was fully booked and had given away our room! This is with 3 sleepy, fussy kids. Fortunately, we found another place nearby. After getting settled into the room and a long day of traveling, Stacie suggested I run for a beer and bring back some water and snacks. I'm walking down the main street in backpacker area. Actually, weaving through the motorcycles parked on the sidewalk was more like it. I'm offered marijuana, cocaine, and/or "a nice girl" 3 times already. Music is blaring from about 10 separate bars. Trying to take it all in, I realized that my path was blocked by a tree and 3-4 guys lounging on their motorcycles. The guy gets right in my face and says, "F**k you white man. F**k you. F**k you." The adrenaline slowing time, I realize I am trapped on three sides. The guys on their bikes looked surprised (but not shocked). Are they in on it? Can I take them all? I am much bigger than them but I'm alone. They are not coming towards me though. The pickpocket is not backing down or away. Is this going to turn into a mugging? Thinking that an American fighting a bunch of Vietnamese has not worked out well in the past, I yell "NO, F**K YOU! ", shove the guy and high-tail it outta there. I found a cafe about a block away to have that beer and calm my nerves. I had everything in my pockets. We had been in Vietnam no more than 3 hours.